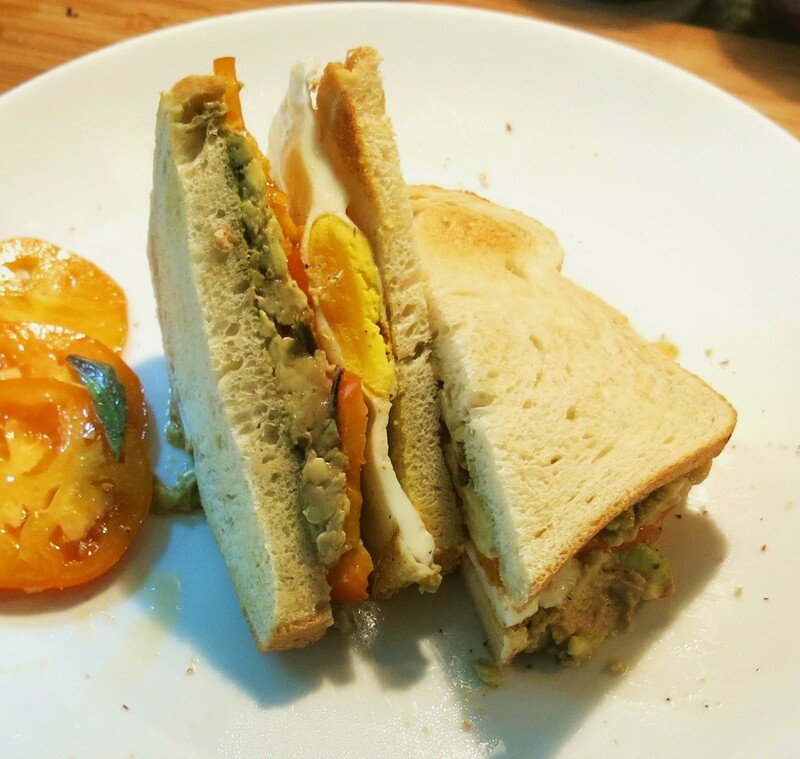 It’s difficult for The Goddess to determine which component—avocado, fried egg or tomato—is the most important, the front flavor, if you will, of this sandwich. She thinks about these things, in the hopes that she will come up with a stellar and solidly conclusive answer for you. Today, she’s got nothin’. She just knows that it works. The spectacular truth is, they are all an equal and essential part of this deliciousness. I listed them alphabetically, because I simply couldn’t decide. And we have only taken into account the stuff we’re putting between those two slices of bread. Right? We haven’t even taken the bread into account and that’s pretty important, too. 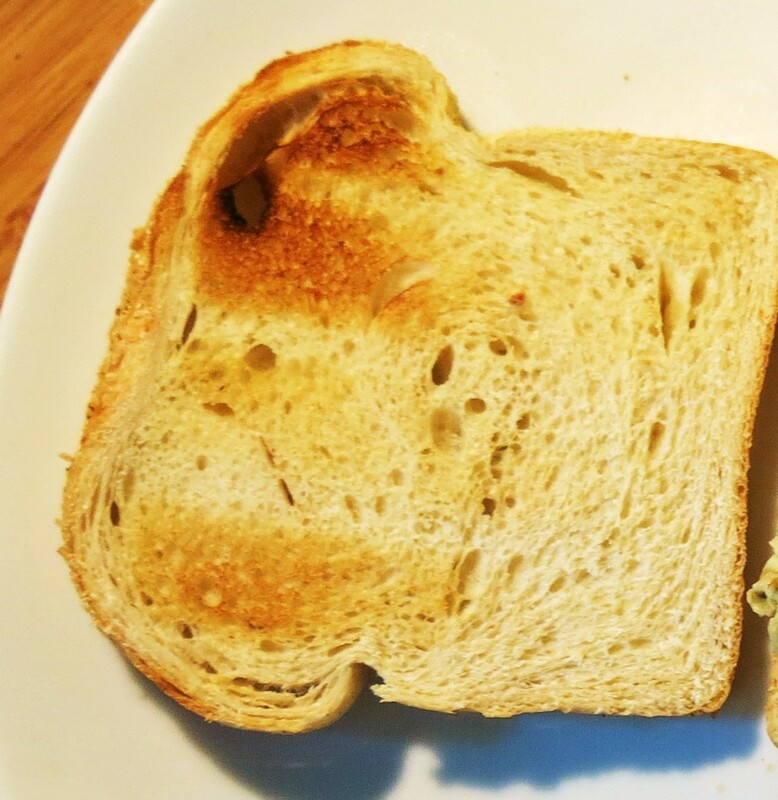 I prefer to lightly toast the bread, because this is a juicy, run-down-your-arms-type of sandwich. In other words, the best kind of sandwich. This is great with a bowl of Tomato, Corn and Fennel Soup for lunch or dinner, or for breakfast, because it takes longer to fry the egg than to put the whole sandwich together, or for a nutritious, delicious late-night snack. This is the perfect any-time sandwich. It really is. BUT, when it’s tomato season, this sandwich sings and sparkles. First, begin frying an egg. 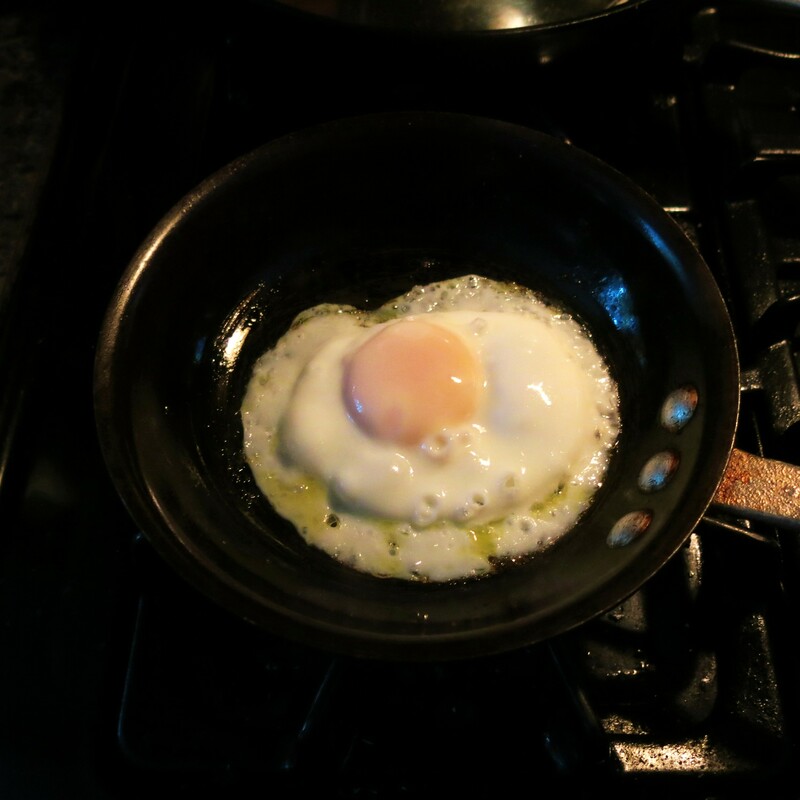 You can see how to fry an egg perfectly by checking out the post on that. In this case, you don’t need to concern yourself so much with a nice runny yolk. 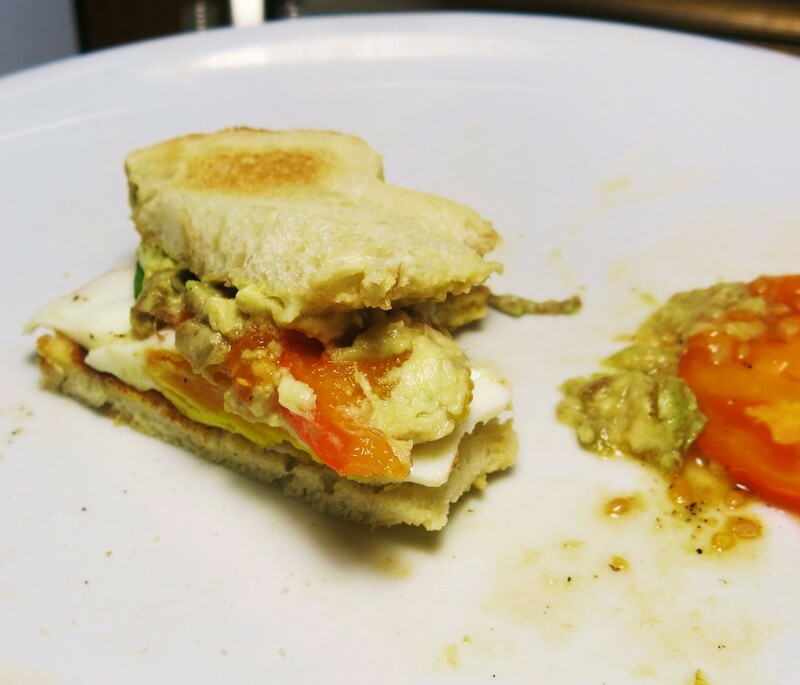 While I do love an oozy, luscious yolk, it really doesn’t change the actual flavor of the sandwich. Second, you put the toast in the toaster to do its magic. 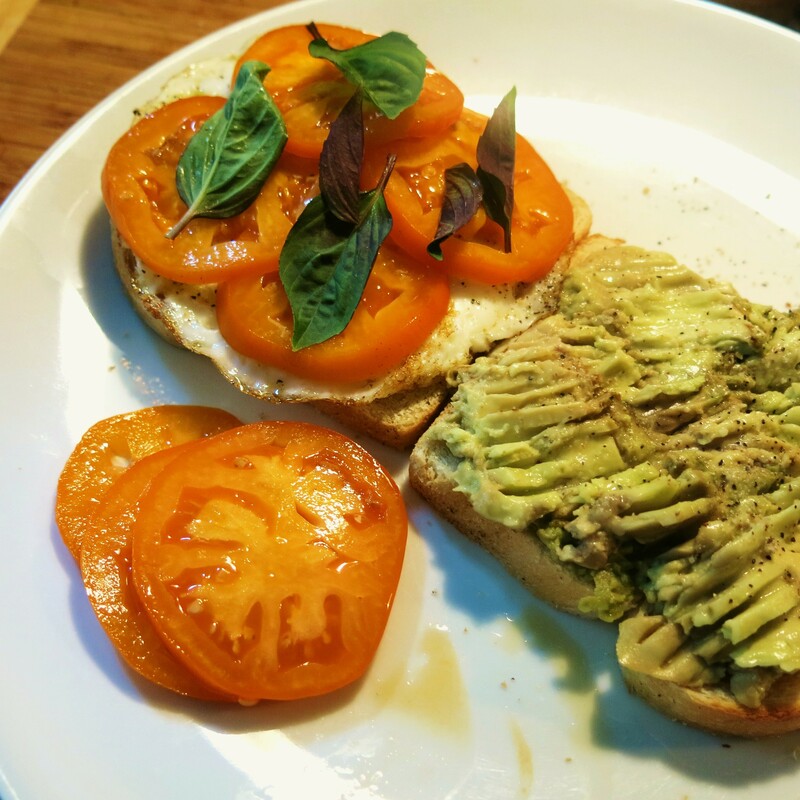 I like to lightly toast the bread and here I used English Muffin bread, but I love this with a good whole-grain bread or sour dough, as well. Use gluten-free bread if you need to. Whatever floats your boat, is what you should use. 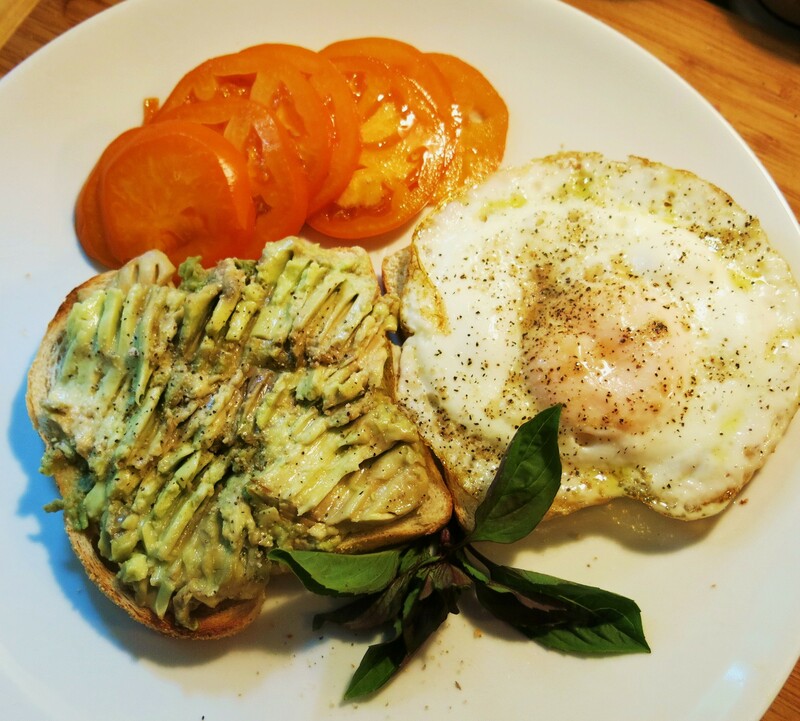 Third, squeeze or slice the ripe avocado onto the bread. Season with salt and pepper. Don’t skip that step or your sandwich will fall flat. We don’t want a flat sandwich. No we certainly do not. 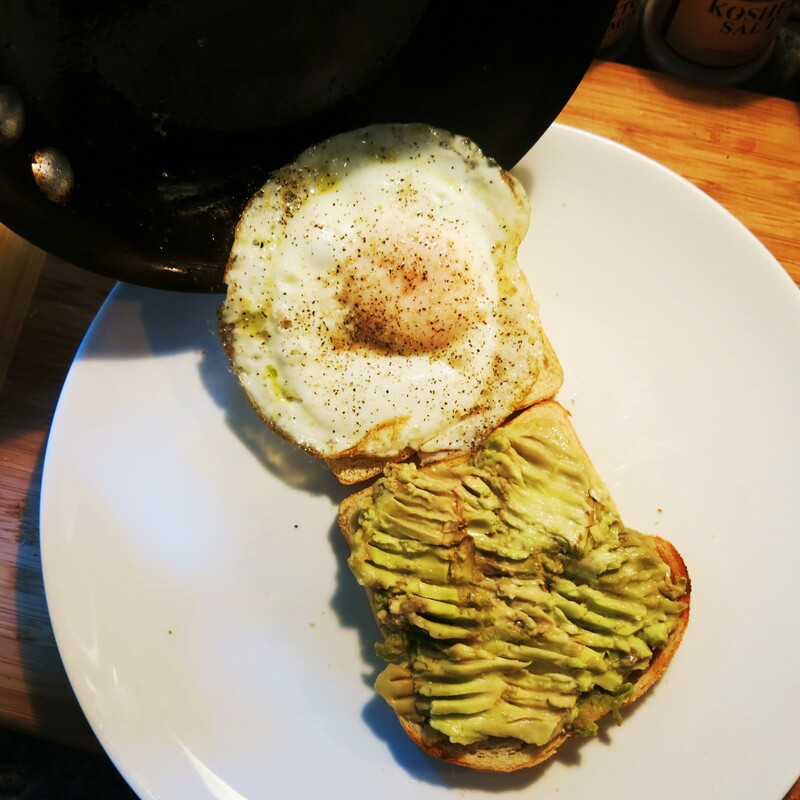 Then, slide that egg onto the bread. Four, slice and place the tomatoes on the sandwich. These are garden tomatoes, so they have fantastic flavor, but this sandwich can be delicious if you use sliced-in-half cherry tomatoes in non-tomato season. FINALLY, it’s ready to eat. Now, there are those that might like to throw 3 or 4 bacon slices or some ham, or a couple of slices of cheese, on our creation. Put ’em on, if that’s what you want. This is YOUR sandwich. I like those, too, but sometimes a good smoky bacon is better with just tomato. See…The Goddess can be a purist at times, but not here. She wants to taste the avocado, the egg, and the tomato with each bite. As you can see in the pictures, she did toss on a few basil leaves, so maybe she’s not as pure as she lets on. I’ll have to talk to her about that. Choose what works for you, but these three, four if you count the bread, so four ingredients just work, and they work extremely well. What else can I say? That was so good, I’m having one for breakfast tomorrow.